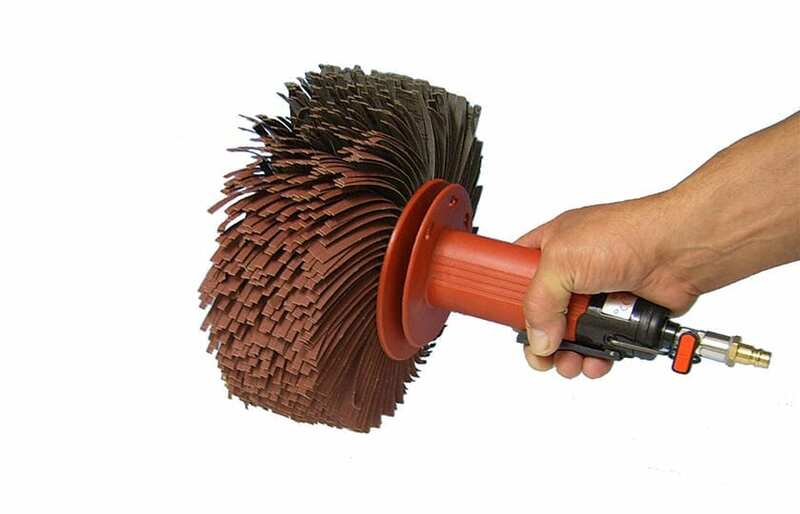 The pneumatic one-hand tool FAPI-F6 can be used with a variety of Picard tools, such as deburring or profile grinding wheels, sisal cord leather brushes or fibre brushes. The low weight and the size of the powerful machine guarantee fatigue-free operation. We will be happy to provide you with a test device for you to try out. Suitable for wood finish sanding in grain sizes 100 to 180 and intermediate lacquer sanding. The unit may only be operated in conjunction with a maintenance unit, i.e. water separator, pressure reducer and oiler (max. 6 bar). Oil dosage: approx. 2 drops of light pneumatic oil per minute. The air hose between the maintenance unit and the unit must not be extended. If the grinding effect decreases, slowly increase the air pressure up to max. 6 bar. For this reason, the maintenance unit should be positioned as close as possible to the workplace.